The Institute for Social Research has a strong tradition of producing computational social science research. Increasingly, there are research efforts across the Institute that integrate data science approaches and methods into the social sciences. The purpose of this work is to develop these methods further and use them to improve the understanding of diverse social science phenomena. As data science (the convergence of expertise from the fields of advanced math and statistics, computer science, and social science domains) begins to take on a distinctive role across disciplines, we will plan events and resources for researchers who are currently participating in or interested in the area of social science data science. For additional information, please contact Jule at: julianek@umich.edu. Join our list: Click here to subscribe to email updates (about once per month). 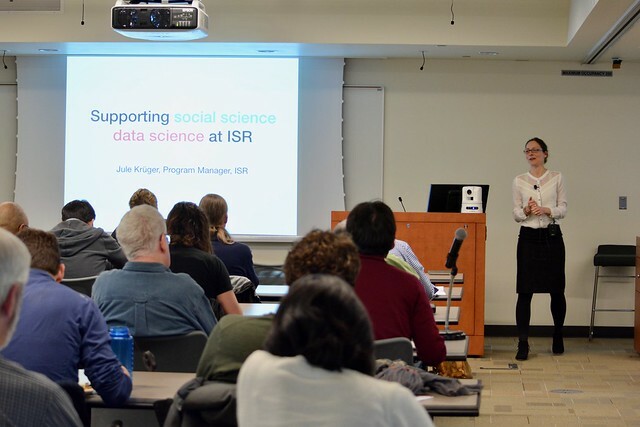 Jule Krüger will be available to talk about the ISR Data Science program and resources. Click here for more information and to submit a paper. Do you write code for computational social science projects? Are you interested in advancing your programming skills? Do you spend a lot of time on Stack Overflow? Would you like to connect with other people in the ISR hacker community? If you answered `yes‘ to at least one of these questions, then you are warmly invited to join our new hackerspaces at the Institute for Social Research. The communal hacking opportunities are being hosted by members of the ISR community for faculty, staff, and students. Participation is open to anyone interested in computational social science research. Mondays, 4-6PM, ISR Thompson, Room 1450, with CPS faculty Yuki Shiraito. Jule Krüger, Program Manager for big data and data science at ISR, reported on new initiatives that are designed to facilitate data science research and training in the Institute. Seth Meyer, Research Computing Lead at ARC-TS, presented resources for high performance computing with a specific focus on social science applications. Kerby Shedden, Director of CSCAR, highlighted resources for research consultation and training. Libby Hemphill, Associate Professor in the School of Information and Director of Resource Center for Minority Data, reported on the development of a Social Media Archive at ICPSR.